There is nothing better of a Sunday afternoon than to visit a cricket club, and Slinfold has one of the oldest in Sussex, the gentle thwack of willow on leather, the gentle applause of the spectators, the cucumber sandwiches. Except this Sunday the cricket outfield was filled with motorcycles, and better than that custom motorcycles, live music and a hog roast, ah that’s better, not a white suited sportsman to be seen. Especially as I get so easily confused with the innings and outings of cricket, but do appreciate a nice afternoon tea. The event was the P and D Custom Bikes open day and Bike Show, and included many bikes that they have had a hand in building and their current build and even cooler a free event. With lots of local clubs attending it took me forever to move away from the bike park with all the “hello Bosun how you doing” but with as much going on in the bike park I was happy to while away the time. 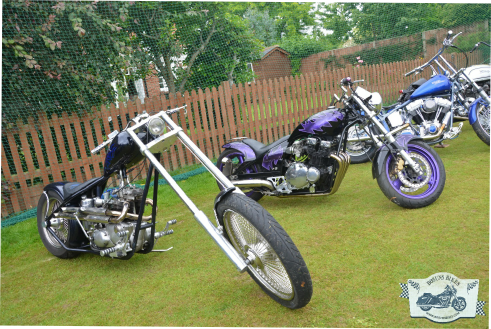 In fact the area was almost a small show on its own, with some great bikes including Rays Guzzi Chop, Mr Hogpoge, Ben and the Zombie Hunter and time to admire Micks rebuild of his bike and the fab paintwork on his bike. There was also a bright green Kawasaki custom with white wheels which defied all categories which was drawing a crowd either way it was cool, maybe a modern bobber is closest. For a show on one of the busiest bike weekends we have had, when also I was told it had rained like mad further south though I arrived in glorious sunshine, there was still a great turn out, as per usual many of the bikes in the car park were worthy of parking in the show, but on such a relaxed day it really didn’t matter. Up on the field it was nice to see Johns Triumph with fab squillion spoked wheels still out and about, it must now be over 15 years since the build but looked as good as ever, and Tony’s s and s powered white attitude custom bike looked short against it. And P and D,s own gold custom and green triumph digger set off the pavilion lovely. A fab little GS500 custom, known as the steamska instead of steampunk, was very clever and drew quite a crowd, with lots of neat tricks like seat operated fuel cut outs and all built for £300 £18 of which was in cans of paint, and £40 for a French moped seat. The whole area was crowded with the elite of local bike clubs and builders, and even Beaky was seen out in the daylight, and not tucked in his man cave a rare sighting. The whole area was pretty transient as many clubs used it as stop offs on route to other events. Poor Hobbits chop had decided to take a rest, until threatened with jump leads when by a miracle and several swings on a size 10 on the kick start it lurched into life.